Obama brings kids to the White House as props for photo-op and emotional appeal to unveil his illegal gun control plans. Obama despicably using kids to undermine the Second Amendment via executive order is a perfect example of why the Tea Party can not go away. Due to extensive media coverage of Obama's Disarmament Show, low info voters will cry hearing stories of how guns make kids fearful and give Obama carte blanche to do whatever he deems necessary regardless of the Constitution. Predicting from their pattern of spineless behavior, Republicans will probably simply go along with Obama's illegal dictates. So, who will stand and be the voice of our Founding Fathers and We The People? Answer: The Tea Party. 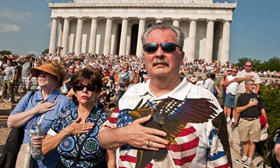 Despite the Tea Party being falsely branded as a bunch f racist extremists by Obama's supportive media, we are the lone voice and last hope for America as intended by our Founding Fathers. If we quit, America becomes paradise lost. As I child, my cousins said I was stubborn. If I became annoyed or they refused to play my way, I would pick up my toys and go home. Unfortunately, some on our side have reacted the same way since the reelection of Obama. Frustrated and angry, they have taken their toys and gone home to play golf, work in their garden or take up basket weaving. Brother and sister patriots, America can not afford the luxury of us behaving like frustrated, angry and stubborn children. If we do not continue fighting, Obama and company will usurp every freedom we have been granted to us by God, our Founding Fathers and fought for by our military. I have been reading Proverbs lately which speaks a lot about "diligence." Victory and prosperity are the fruits of diligence. We must stay diligent in our efforts to stop Obama, no matter how hopeless or fruitless our opposition may appear. No, the Tea Party is NOT done. We must stand even more closely united, stand up for our own and boldly speak truth to power. Quite frankly patriots, there "ain't" no body else but us. Go with God!